How well do you think the dollar would do? Well, all of the above has happened in 2018 and the top performing currency in G10 has been…the Japanese yen. It has eked out a small gain in spot terms, though adjusting for carry it is down for the year. Meanwhile the euro is only down 4.5% in spot terms (down 7% adjusted for carry) and the Chinese yuan is down 5.5% (down 1.5% adjusted for carry). Not such a great dollar performance given (1) to (3). Now, after yesterday’s dovish Fed hike it looks like we are coming to the end of the Fed hiking cycle, US growth is already losing momentum and US stocks are falling more sharply. And even with a few more hikes, Fed policy rates would settle at their lowest level in history for the end of a hiking cycle. It’s even more surprising given how low the unemployment rate. This does not augur well for the dollar. We’ve laid out our dollar view for 2019 in an earlier publication, The punchline is that we are bearish on the dollar: US yields are simply not high enough to make up for the US’s growing twin deficits, and lack of foreign capital inflows. The bigger swing variable is risk appetite at least for the composition of dollar weakness. So far this year, we have seen cascading risk aversion, which has resulted in risk market unwinds not being contagious. So while the EM sell-off and Italian weakness did see bouts of dollar strength, the recent US equity and credit weakness has not. In fact, over the past three months, the Turkish lira has delivered gains of over 25% including carry, while BRL, INR and IDR have delivered gains of around 5%. 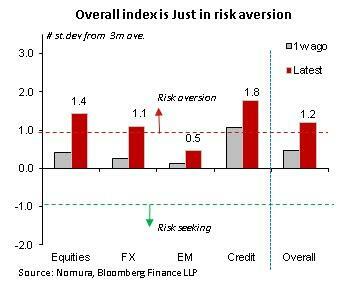 Currently, our risk monitor is showing risk aversion, though not in EM. Should we see broader and deeper risk aversion then the dollar could regain its footing against these higher risk currencies. However, our bias is for this not to happen in the coming months. But even it does, the dollar would still likely struggle against the euro and yen.